Yeah, we all look away when driving past the latest furry casualty. Death on the road can be a messy business and just about all of us are guilty of adding to the carnage. Those dizzy squirrels that can’t make up their minds and those bunnies with a death wish that shoot right under our wheels. I’ve heard a skunk actually explode underneath me a millisecond after it insisted on bolting to its doom. Roadkill, however, is a valued part of the food chain my part of the woods. There’s all those turkey vultures to support, the crows and ravens, coyotes, foxes, weasels and fishers. The noble bald eagles, which have recently favoured us with a return to the region, turn out to be scavengers in search of washed up fish or whatever else conveniently deceased they happen upon. People also get in on the bounty. The home care worker who used to visit my old dad told us she did so much driving that she had hit a total of six deer in her travels. She simply stopped, flung the deer in the back of her truck and took it home for her husband to skin, cut up and stow in the freezer. Free venison for the winter. Deer head and neck. Where’s the rest of it? Out biking this week, I came across the head and neck of a deer on our back road. Most puzzling since deer usually have four legs and fluffy tail attached. So I ventured to peep in the ditch behind the long grass of the road edge. 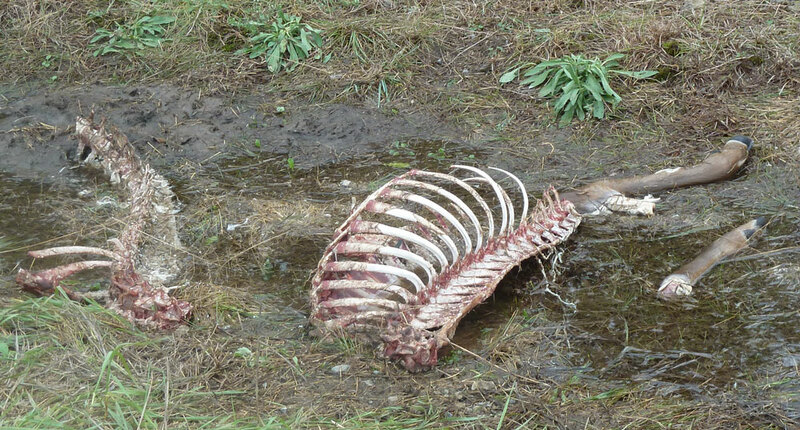 There lay the rest of the deer, stripped clean already, reduced to a white skeleton with only the bare bones and inedible shins left to be seen. That meant there had been a joyful feast for the coyotes the night before. The whole neighbourhood must have been invited to devour every scrap right down to the ribs and vertebrae. They must have done it stealthily, melting to invisibility when a car drove past in the dark. Nor did they touch the head which would have taken them onto the open road and into danger themselves. Organized, clever, efficient. And they probably don’t have to hunt for a week afterward. 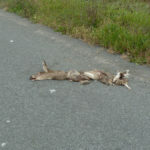 Most roadkill can’t be helped and nature always recycles. If you hit a moose, it’s you that’s likely to be the roadkill. And if you are one of those vicious, slime covered, brain dead unspeakables who deliberately aim at turtles crossing the road, you deserve to join the turtle on the pavement. Previous Previous post: Discovering the Local Photo Club. An Excuse to Mess About with Photoshop.